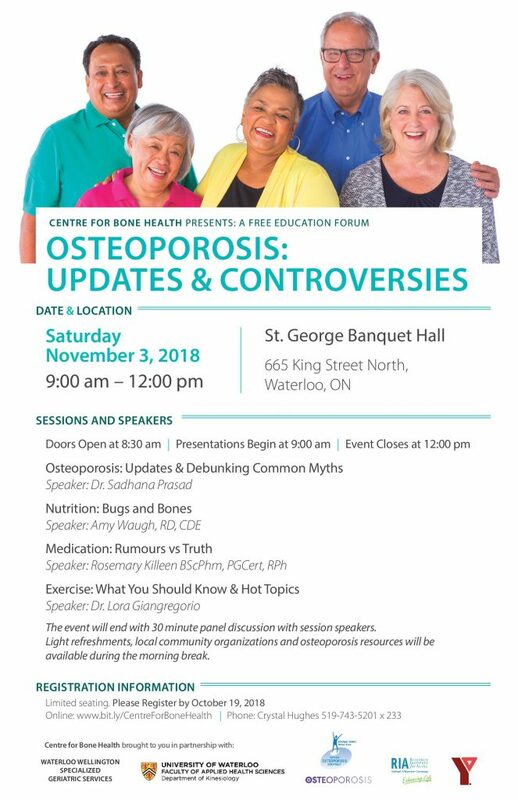 The Centre for Bone Health presents a free education event titled ‘ Osteoporosis: Updates & Controversies’ on Saturday, November 3 from 9 am to 12 pm. The event is scheduled to take place at St. George Banquet Hall in Waterloo, Ontario. Presentations will begin at 9 am and the event will end with a 30-minute panel discussion with event speakers. Light refreshments will be served and participants will have access to osteoporosis resources as well as resources from local community organizations at the event. Event partners include: Waterloo Wellington Specialized Geriatric Services, University of Waterloo (Faculty of Applied Health Sciences), Osteoporosis Canada, Ontario Osteoporosis Strategy, The Schlegel-University of Waterloo Research Institute of Aging (RIA) and YMCA.